While in pursuit of a PhD in ocean engineering, Ana Barros, professor of civil and environmental engineering, was applying for a NASA fellowship when her advisor suggested an intriguing idea. The suggestion was that Barros could "try something on snow," as satellite remote sensing capabilities were notoriously difficult to use in that field. Later, her advisor suggested she do another study on mountains and precipitation in the terrain before leaving Barros's side for a sabbatical in Australia. After six months, her advisor came back to the United States to find Barros had a whole model planned out; Barros had essentially started "the whole rest of (her) life." "As long as I'm learning, I'm happy," Barros noted, reflecting on the series of unexpected events that led her into her current field of research. With consistent research funding provided by the partnership with NASA she formed in graduate school, Barros started working on the remote sensing of precipitation in the "days before big data" and before data analysis became a "hot topic." For example, one of her graduate students discovered a way to use neural networks and satellite microwave observations to estimate relative humidity distribution in the atmosphere all the way back in the '90s. The work, however, received little to no recognition until the late 2000s. It wasn't until then that, at a NASA Senior Review meeting, a representative noted that the approach increased the amount of useable data taken from a new, previously unprofitable satellite from under 20 to over 90 percent. With early achievements like these, Barros has been a key player in weather prediction using remote sensors before it even became an area of expertise. "I really hoped to get the quality of weather prediction to improve, to become reliable in a way that we can explain the physics and get the right results for the right reasons," said Barros. Barros's current research focuses on the fundamentals of hydrometeorology and climate, specifically precipitation. While we already have climate and weather prediction models, Barros says, "We don't actually know the fundamental science to describe the key processes. How does the hint of haze in the horizon evolve to pouring rain in a few minutes?" According to Barros, we have basic, conceptual models of how we think weather and climate processes would work on a large scale, but when compared with the real world, the model predictions are lacking, especially at the small scales important for decision-making. "The true processes are highly nonlinear and work over a very wide range of scales, some six orders of magnitude across," says Barros. True predictability, like being able to predict extreme events like hurricanes and droughts, is the understanding and application of all steps involved, not a lone statement of the outcome. It is therefore the gap between our current theories on weather and the definite laws that Barros hopes to bridge with her research now and in the future. To accomplish her goal, Barros's research group does "a little bit of everything." They observe the weather processes in reality, use remote sensors to collect data, model the processes, perform simulations and complete a lot of data analysis. All these facets of her research make it easy for Barros—who believes that the key to whether or not someone is going to like research is "getting their hands dirty"—to involve undergraduate as well as graduate students in her research. One of Barros's large field campaigns in the Great Smoky and Appalachian mountain systems involved an extensive team of students who gained valuable fieldwork experience by essentially climbing mountains to calibrate and retrieve data from isolated sensing instruments. It's her research in the mountains that Barros implied was her most interesting work. To make accurate models of weather in mountain ranges, her research team first needed accurate data. When her group started taking precipitation measurements, they measured rainfall the way folks usually do—with a rain gauge. But that proved inadequate. Many times the record showed that no rainfall was occurring, and the team thought this was accurate until they purchased disdrometers, which measure drop size distribution. The disdrometers showed that there were, in fact, a very large number of drops falling— drops that were not being measured by the rain gauges. The group then acquired another type of radar, one that works by measuring the radar backscatter signal to find the vertical distribution of precipitation in the atmosphere, which is how weather stations come up with their multicolored precipitation forecasts. With this data, Barros inferred that the drops were getting bigger as they fell toward the ground. Regionally, you can see these very small drops in the form of hazy deep banks of fog in mountain valleys. When another system of clouds comes through and produces a very light rainfall, the drops go through the lower fog and increase in size. "This type of precipitation, although not generally accounted for in most weather models, can account for almost 50 percent of the water cycle at some locations," said Barros. "When you're not measuring this, you're missing a lot of water that the plants are using and that is keeping the soil moist, making it difficult to close the water budget." Elaborating on her research on weather in the mountains, Barros explained a recent analysis she worked on with Yajuan Duan, a PhD student in her laboratory. 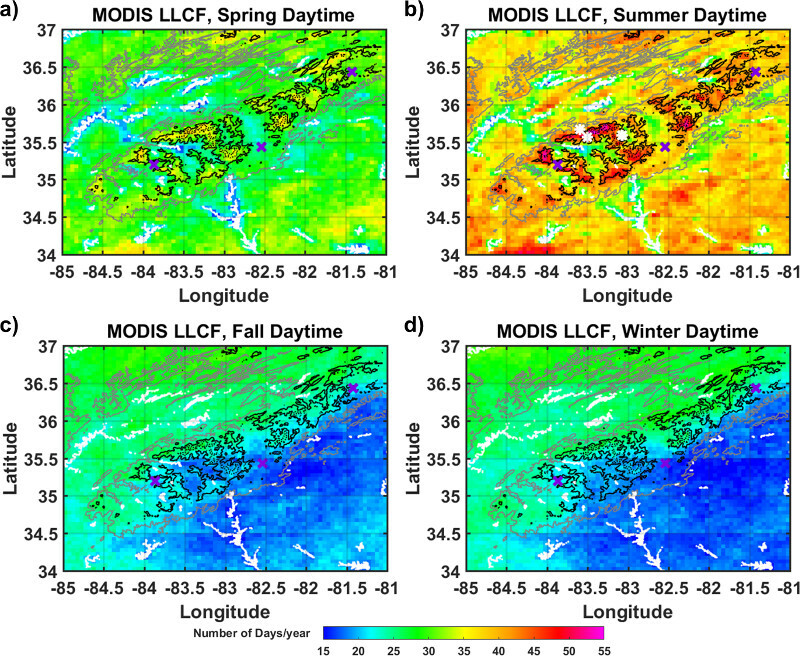 When grouping data taken from a NASA satellite called MODIS each day over a ten-year period from 2006 to 2016, they noticed that, for the majority of summer, a Smoky mountain system in the midst of the Tennessee Valley Authority dams had high concentrations of low-lying clouds form both above its peaks and also, surprisingly, over the regions on the sides of the dammed rivers. Wind over the rivers had caused the water particles to shift to the sides, a process called the lake breeze effect. "It's not that we didn't know this could happen," Barros notes, "we just didn't know the scale and persistence of these impacts on regional climate." When the TVA dams were built, no one truly cared about how they would affect the climate long-term, and it was before the time that environmental impact assessment studies were required. In the later parts of the 20th century, however, people finally began to consider climate change. "In those days, people would talk about fish because building a dam killed fish by eliminating river connectivity, so concerned people were building fish ladders to protect aquatic life," said Barros. "But building a dam also has an impact on the microclimate, like the low-lying cloud formations on the banks of the rivers. Then people in the region complain that it gets too foggy, and vegetables in the winter die because of the humidity and excessive frost." To truly understand the weather and how water moves from one state and one energy level to the next, both the macroclimate and microclimate effects of anthropogenic activities need to be scrutinized. "That's the strong engineering side of this," said Barros. "Engineers tend to look at complex systems and put parts together. We approach problems from a more integrated perspective." Jade Grimes, Pratt Class of 2021, hopes to major in civil engineering with a certificate in architectural engineering.